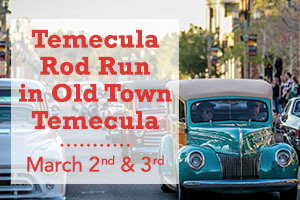 Get Revved Up for the Temecula Rod Run! Don’t miss the excitement at the famous “Friday Night Cruise” on March 2nd, when hundreds of classic cars from all over the country cruise Old Town Front Street from 5 p.m. to 8 p.m. Thousands of automotive enthusiasts and spectators come together for the annual Temecula Rod Run, when 600+ special interest vehicles, hot rods and custom cars go on display. At the Saturday Show and Shine from 9 a.m. 4 p.m., visitors can get an up-close look at these classic vehicles. Music and entertainment, delicious food and community vendors add to the weekend’s festivities. Lace up Ladies for the Special Edition Divas Half Marathon & 5K! Don’t miss the most glam women’s running series in the nation! It’s all about girl power! 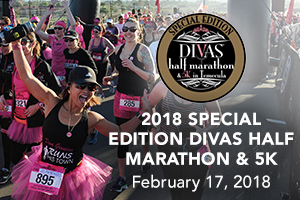 Mark your calendar for the Special Edition Divas Half Marathon & 5K in Temecula on February 17th! Get glam, have a great run and enjoy complimentary wine tasting after the race. Both races kick off at 7:30 a.m. at the Monte De Oro Winery & Vineyard. All participants receive pink tutus with their registrations and other specialty items. This race is capped at 2,000 runners, so register now to guarantee your spot! 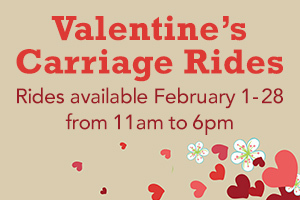 February is the Month of Love and the perfect occasion to enjoy a romantic carriage ride with your Valentine. Costs vary per package with the Temecula Carriage Company. You and your sweetheart can enjoy a one-hour private horse drawn carriage ride for $150 per couple that includes a bottle of wine, or there is also a two-hour package as well as a 25-minute ride for $60 per couple. Rides are available February 1st – 28th from 11 a.m. to 6 p.m. Reservations are required and subject to availability, so call today!